The three flashbacks featured in The Last Jedi show something interesting with regard to how Luke and Kylo convey information to Rey. When Luke first gives his version of events, he leaves out the fact that he drew his lightsaber during his fateful encounter with Kylo. When Kylo gives his account, he makes Luke out to be a vengeful monster who tried to murder him in his sleep. Both accounts are shown to not objectively be the truth in the third flashback. Kylo’s version is from his own warped perspective while Luke lies by omission. This of course begs the question: if both characters have been shown to be unreliable narrators, are there other places in the story where the information they are giving isn’t the complete objective truth? For the purposes of this article, let’s consider the question: Are there other points in the story where Luke tells Rey something but again lies by omission, leaving out important details and context? Another occasion where Luke answers a question that Rey (and the audience) asked was when he said that he came to Ahch-To to die. Is this the whole story or is he leaving something out? Note that both when he tells Rey this, and when he gives his first account of what happened with Kylo, his back is to Rey. Can he not bring himself to look her in the eye when he knows he’s lying? If he truly just wanted to live out the remainder of his days in solitude after failing with his nephew why did he seek out the First Temple? This question is never answered. Another unanswered question is why Luke cut himself off from the Force. Rey, and by extension the audience, assume that he did it because he had lost hope and given up, but the movie never actually gives his reasons. Are we being misled? The Visual Dictionary for The Last Jedi contains an interesting little nugget of information in the section on Luke’s Jedi robes. 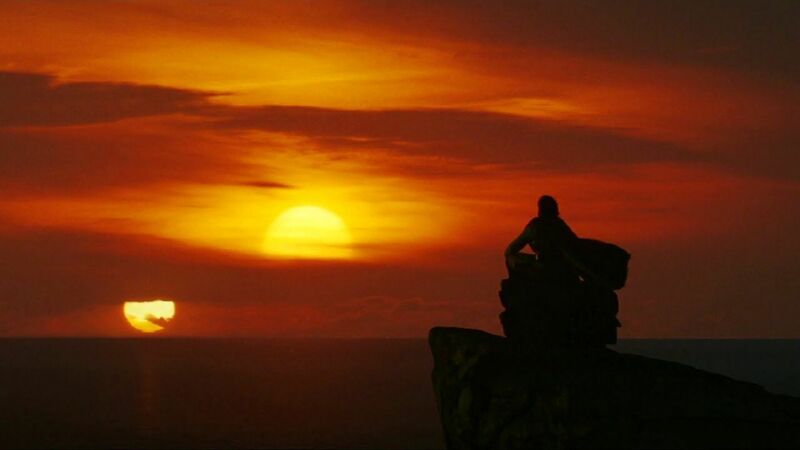 “Luke only wears this robe to undertake one final Jedi rite.” and “Luke’s donning of ceremonial robes is not an indication of a return to faith, rather Luke sees it as his last rite to end the order.” So when Rey first meets Luke at the top of the island she interrupted whatever rite Luke was about to perform. The Visual Dictionary doesn’t go into detail about exactly what this ritual is, just that its result would be the end of the Jedi Order. Luke is the titular last Jedi. Him becoming one with the Force would bring about the end to the Jedi Order. We would like to propose that Luke stating that he came to Ahch-To to die is true to a certain extent, but ultimately a mischaracterization of what he’s actually attempting. We don’t believe that he is suicidal or that he has given up on the galaxy and just wants to live out the remainder of his life in exile (though he is certainly depressed and deeply regretful). We believe that Luke severing himself from the Force and then becoming one with the Force are both parts of a Jedi ritual, one that Luke feels he must at all costs undertake in order to make things right. So what might he be attempting? One curious detail from the Last Jedi is the symbol on the floor of the First Jedi Temple. The mosaic pool depicts the Jedi Prime, the very first of the Order, seated in a state of meditation and balance. A curious thing about the image is that the Jedi Prime is flanked by two orbs. The image bears a certain resemblance to another image of a Jedi seated in a state of meditation and balance while being flanked by two orbs. Also interesting is the fact that the shot of Luke’s cloak floating away pulls back to show the image on the floor. During this scene the Jedi Prime image is perfectly divided in half between light and shadow. Its seems as though Rian Johnson wanted Luke’s death to be associated with this image of the Jedi Prime with the lighting reinforcing the idea of balance. The movie implies that Luke died of exhaustion from his Force projection. Kylo’s line earlier in the film to Rey during their first Force connection hints at this: “You aren’t doing this; The effort would kill you.” While Luke’s Force projection feat does seem to have taken a lot out of him, is it ultimately what killed him or is there another possible alternative? We’ve seen Jedi die of wounds and natural causes before. With Qui-Gon, Yoda, and Anakin we see them lying down, we see all strength leave them, and we see them breathe their last. This isn’t how Luke died. We see him collapse yes, but we also see him sit back up and seem to regain strength. Ultimately, Luke’s death is more akin to Obi-Wan, who willed himself into the Force, than to the more natural deaths of Qui-Gon, Yoda, Anakin, etc. So the Visual Dictionary says that the Jedi Rite that Luke was about to perform would result in the end of the Jedi Order. As the Last Jedi, Luke becoming one with the Force would result in the end of the Jedi Order and Rian Johnson says that in becoming one with the Force Luke has “completed” something. He’s completed the ritual that he was attempting when Rey first arrived. The reason for Luke’s self imposed exile at the first Jedi Temple wasn’t because he had lost all hope and given up. It was because he was in the process of performing the ritual, undergoing a metamorphosis, that would transform him into a Jedi Prime. The Jedi Prime is one who is in a state of balance not between the light side and the dark side, but someone who is in balance between the spiritual and the physical, in balance with “life and death which brings new life.” The metamorphosis then involves three phases. The first is where the person undergoing the ritual must establish themselves in a purely physical state. This is why Luke cut himself off from the Force for a period of time. The second is where the person undergoing the ritual must establish themselves in a purely spiritual state. This is why Luke had to become one with the Force for a period of time. The third is where they return in a state of balance between the two as something more powerful than you can possibly imagine. This would be Luke in IX. It’s possible that this ritual must be performed at a place like the First Temple that is particularly strong with the Force. This is why Luke refuses to leave despite knowing that those he cares about most are in grave danger. It also seems as though the transformation takes time for each phase. This is why Luke wrecked his X-Wing. He knew that he couldn’t afford to succumb to the same temptation he did in Empire Strikes Back where he rushed off to save his friends rather than completing his training, so he eliminated that possibility entirely. This would explain why Rian Johnson has said that Luke felt he had to exile himself for the greater good and that it was the hardest thing that Luke had ever been faced with. He feels he must finish the ritual to make things right and leaving before then to help his family and friends would spoil any chance of that. This explanation for Luke’s exile and death also lines up with Luke telling Leia “No one is ever really gone” and him telling Kylo “See you ‘round, kid.” It also explains why Rey senses that Luke died not only with “peace” but also with “purpose”. He knows that he’s going to die, but he also knows that he’s coming back. Why would Luke feel the need to undergo such a transformation? The novel The Legends of Luke Skywalker gives an interesting hint. A group of ancient Force users refer to something called a “rot in the Myst” (Myst being their term for the Force). They believe that Luke is trying to fix it. Perhaps for the Force to truly be balanced this “rot” must be repaired and Luke felt that he could only do that as a Jedi Prime. Here’s some other food for thought. Luke has been following the Hero’s Journey Cycle since the beginning of A New Hope. The final stage of the Hero’s Journey is called “the Master of Two Worlds”. That’s exactly what the ritual we are proposing would make Luke. This is called setting precedent. If this new power had first appeared in an action sequence in IX it would have had no set up. Introducing it in the Last Jedi ensures that the audience is familiar with it when it shows up again. IX is all but guaranteed to feature Luke calling down lightning from the sky on an even more epic scale. Love it. You made a good case for it. I wish it would prove true but I doubt it will. I’ve lost hope for anything so grand. this would be great and possibly tie-in to the idea that lucas had regarding the emperor, yoda and obi-wan fighting from beyond. Previous Previous post: You Won’t Believe these Theories About Episode IX!!! Next Next post: Episode IX Teaser Predictions!